Before Ribbentrop had even arrived in Moscow to sign the Nazi-Soviet Pact, the British were already reacting to news of the agreement which had leaked out. The Pact didn't change anything as far as the British government was concerned and it so informed Adolf Hitler. Prime Minister Neville Chamberlain sent the Führer a personal letter warning him that if the Nazis invaded Poland, the British would "employ without delay all the forces at their command, and it is impossible to foresee the end of hostilities once engaged..."
The letter was delivered to Hitler at Berchtesgaden on August 23rd by British Ambassador Nevile Henderson and sent Hitler into one of his classic fits of rage. Up to this point, Hitler had been assuring his generals that Britain and France would not go to war over Poland. "The men I got to know at Munich are not the kind to start a new world war," Hitler boasted during a military conference at Berchtesgaden. All during 1939, Hitler had been spending more and more of his time atop his Berchtesgaden mountain retreat trying to figure things out. Thus far in his career, he had been the master chess player on the European stage, humbling and outmaneuvering all of his opponents, always a step or two ahead of everyone. But now the game had changed. No longer was it a matter of bluff and dare. It had come down to actual threats of war, upon which rested the fate of millions. Hitler threatened war. Poland threatened war. Britain and France were threatening war. Even the Americans were getting involved. President Franklin Roosevelt barged into the whole mess with a telegram to Hitler inquiring: "Are you willing to give assurance that your armed forces will not attack or invade the territory of the following independent nations?" Roosevelt listed 31 nations including Poland, the Baltic States, Denmark, the Netherlands, Belgium, France, and Britain. Hitler gave his answer during a speech to the Reichstag and assured 'Herr Roosevelt' that Germany only had peaceful intentions toward its neighbors. Germany, Hitler declared, "had not thought of proceeding in any way against Poland." The problem was that nobody outside Germany believed him anymore. Hitler had lied once too often. And he had made the dreadful mistake of humbling and embarrassing the leaders of the British Empire, who would never forgive him for trashing the Munich Agreement. Britain would fight, they warned him and it could mean a new world war. But despite the repeated warnings, Hitler was still convinced Britain would back off at the last moment. 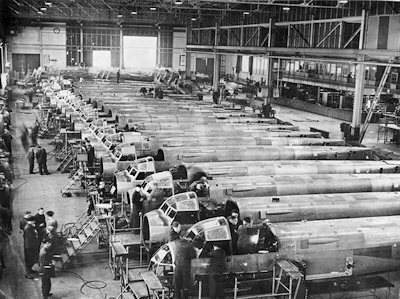 Hitler's war economy seen in full swing as Junkers Ju-88 high-speed medium bombers are mass-assembled - each capable of carrying about 3,000 pounds (1500 kgs) of bombs. 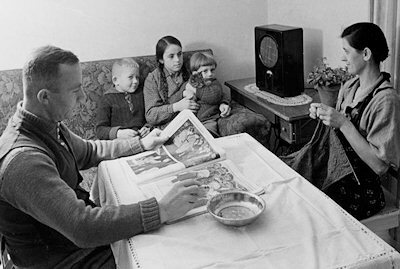 Below: A middle class German family and their radio. Such inexpensive radios were distributed freely by Nazis to needy families allowing Goebbels' powerful propaganda to reach everywhere. By 1939, all news and information from the outside world had essentially been cut off and only pre-approved music, entertainment, Nazi speeches and news reports were ever heard. 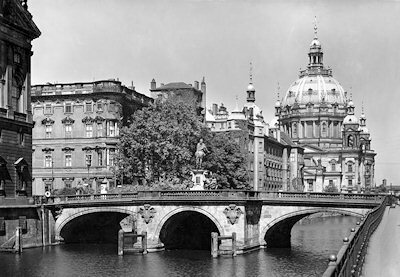 Below: A look at the grandeur of the Kurfürstendamm bridge, castle and cathedral in pre-war Berlin - a city that would be 90-percent destroyed in the coming conflict - a fate shared to varying degrees by many great cities in Europe, England and Russia. Below: Summer 1939 and the last days of peace. 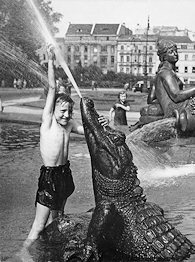 Left: A youngster in Berlin frolics in a fountain featuring animals that spray water. 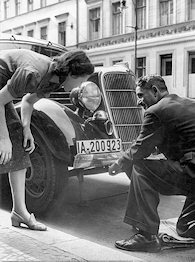 Right: Advice is given to a young German driver on how to use a car-jack to fix a flat tire. The great problem for Hitler at this point in his career was that his own bloated ego was fogging up his formerly crystal clear insight into international politics. The Führer-god of Germany was ever so slowly succumbing to the belief that he was infallible, that if he said such-and-such a thing was true, then indeed it must be true. He was suffering from a kind of creeping megalomania and it was clouding his judgment, blinding him to reality. However, there was nobody left in Germany willing to tell him he was wrong, no one willing to question anything he said, no matter how outlandish it seemed. When Hitler gathered his top generals for three separate pre-war conferences in 1939, they listened in complete silence to the dictates of the Führer, which would bring about the worst catastrophe in the history of humanity. On May 23, 1939, the Führer assembled fourteen senior military officers in Berlin including Hermann Göring, Admiral Raeder, Generals Brauchitsch, Halder and Keitel, and explained that Germany needed a war because the Reich's economy was in such dire straits. And fixing Germany's economy would be "impossible without invading other countries or attacking other people's possessions." For Nazi Germany, the acquisition of Lebensraum had now become an economic necessity. This was due to Hitler's massive re-armament program which was soaking up an amazing 23 percent of Germany's annual Gross National Product. Hitler had ordered German industry to drop everything and re-arm the country as fast as possible. As a result, the employment level in the Reich stood at 125 percent, technically, meaning there was a huge labor shortage with many jobs left unfilled, especially in agriculture. This was occurring even though the overall population of the Greater Reich had swollen to 80 million with the acquisitions of Austria and Czechoslovakia. The lopsided Nazi economy was headed for a crash unless there was an immediate reallocation of labor and raw materials, or, unless fresh supplies of men and materials were acquired from outside the Reich. This is the option Hitler chose and so informed his generals on May 23rd. A month later, June 23rd, Göring convened a meeting of the Reich Defense Council to coordinate the total mobilization of German manpower and resources for the coming war. Hitler was not there, but 35 civil and military officials were present including Keitel, Raeder, Halder and SS Leader Heinrich Himmler. Hitler, it was announced, had decided to draft seven million men into the armed services. The resulting severe labor shortage was to be made up by forced labor, utilizing prisoners of war, along with inmates from concentration camps and prisons. Himmler stated that "greater use will be made of concentration camps in wartime." Göring said that "hundreds of thousands" of Czech workers would be taken into Germany as forced laborers in agriculture. This marked the inception of the Nazi slave labor program, designed to fill the Reich's insatiable need for cheap manual labor. By late August, the path to conquest was cleared for Hitler by the Non-Aggression Pact with Stalin, insuring that Germany would not have to fight a war on two fronts. While Ribbentrop was in Moscow to sign the Pact, and the ink on the paper was not even dry, Hitler gathered his generals at Berchtesgaden for their final pre-war conference to give them the green light for the invasion of Poland. It was now, Hitler announced, his "irrevocable decision" to go to war. "Our economic situation is such that we cannot hold out more than a few years. Göring can confirm this. We have no other choice. We must act," Hitler said. Thus far, all of Germany's territorial gains had come as a result of "political bluff" but it was now necessary to utilize Germany's "military machine." "I shall give a propagandist reason for starting the war. Never mind whether it is plausible or not. The victor will not be asked afterward whether he told the truth or not. In starting and waging a war it is not right that matters but victory." And how were his soldiers to behave during this coming war? "Close your hearts to pity!" the Führer ordered. "Act brutally! Eighty million people must obtain what is their right...The stronger man is right...Be harsh and remorseless! Be steeled against all signs of compassion!" Preparations for Operation Himmler were fully underway, with the invasion of Poland now scheduled by Hitler to begin at 4:30 a.m. on Saturday, August 26th. As a prelude to the invasion, Goebbels' propaganda machine went into overdrive spinning out stories of alleged atrocities committed by Poles against tens of thousands of ethnic Germans living inside Poland. For several months now, Nazi journalists had also been trying to prepare the German people for the inevitable war in Europe. They had been personally instructed by Hitler to build enthusiasm for war and to counter civilian pessimism. But the propaganda only had limited success. Most Germans still did not want a war. Amazingly, on the eve of battle, Friday, August 25th, Hitler lost his nerve and postponed the whole invasion. There were two big diplomatic developments that day which had shaken the Führer's confidence. First, Hitler became aware that Britain and Poland had signed their treaty of mutual assistance against German aggression. Secondly, Mussolini informed the Führer that Italy was unprepared for war and would not join the fight, despite the military Pact of Steel it had signed with Germany. About 6:30 p.m. that day, Hitler summoned General Keitel to the Reich Chancellery and told him: "Stop everything at once...I need time for negotiations." Above all, Hitler wanted to prevent British military intervention, even at this late date. The Nazis now tried a back-door diplomatic channel, utilizing a Swedish friend of Göring's named Birger Dahlerus as an informal go-between. Göring sent him to London to tell Foreign Secretary Halifax that the Nazis hoped to achieve some kind of "understanding" with the British. Halifax sent him back to Berlin with a letter stating the British still hoped for some kind of peaceful settlement. Göring thought the letter from Halifax was important enough to bring to Hitler immediately. Accompanied by Dahlerus, Göring arrived at the Chancellery in Berlin around midnight on Saturday, August 26th. Hitler, normally a night owl, had already gone to bed and was awaken at Göring's request. Surprisingly, Hitler paid no attention to the letter but instead quizzed Dahlerus at length about the true nature of the British people. Hitler, like many of the top Nazis, both admired and hated the British, but could never seem to understand them. Dahlerus, who had lived and worked in England, obliged the Führer and spoke about the British. But Hitler started behaving strangely. According to an account later provided by Dahlerus, the Führer "suddenly got up, and becoming very nervous, walked up and down...suddenly he stopped in the middle of the room and stood there staring. His voice was blurred, and his behavior that of a completely abnormal person. He spoke in staccato phrases: 'If there should be war, then I shall build U-boats, build U-boats, U-boats, U-boats, U-boats'...then he pulled himself together, raised his voice as though addressing a large audience and shrieked: 'I shall build airplanes, build airplanes, airplanes, airplanes, and I shall annihilate my enemies!' "
Unknown to Dahlerus, the Führer had good reason to be so edgy. Several hours earlier, he had abruptly changed his mind regarding the attack on Poland and telephoned his Army High Command, ordering them to get everything ready for the new invasion date, Friday, September 1st. Over the next few days, Dahlerus made several more trips between Berlin and London carrying proposals and counter proposals back and forth, all of which came to nothing. The Nazis essentially wanted Poland to hand over Danzig and the Polish Corridor, while the British were reluctant to do anything that smelled like another Munich Agreement. 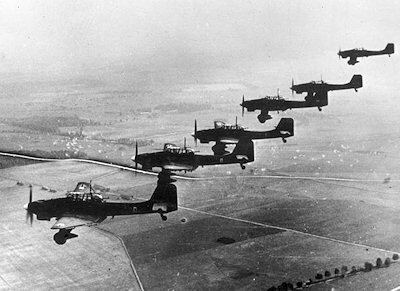 September 1939 - Stuka dive-bombers in action over Poland. The war commenced with a devastating aerial and artillery attack followed by rapidly advancing tanks and troops - the pattern for all that was to come. 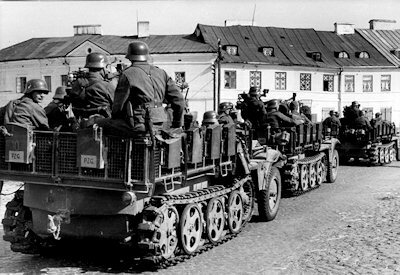 Below: German troops on half-tracks roll into the city of Czestochowa, Poland. Hitler and Ribbentrop also saw Ambassador Henderson several times and successfully manipulated him into rushing the Poles into some last minute negotiations to preserve the peace. For propaganda purposes, the Nazis wanted to make it appear to the world that they had been willing to discuss a peaceful solution with Poland. In reality, they deliberately concocted one obstacle after another to prevent any meaningful negotiations from ever occurring and then said the Poles were uncooperative. All along the German-Polish border, military preparations were now fully underway to launch the invasion. At 12:30 p.m. on Thursday, August 31st, the Supreme Commander of the German Armed Forces, Adolf Hitler, issued Directive No. 1 for the Conduct of the War. Hitler's objective was to destroy Poland quickly via an overwhelming lightning attack then turn his armies westward and deal with Britain and France if they attacked Germany from the west. He was still not sure whether they would actually honor their much vaunted commitment to Poland. At dawn on Friday morning, September 1st, German troops roared across the border into Poland smashing everything in their way. The hopelessly outdated Polish Army put up brave resistance but was crushed without mercy by the incredible German military machine. At 10 a.m. that morning Hitler appeared before the Reichstag in Berlin and announced: "This night for the first time Polish regular soldiers fired on our own territory. Since 5:45 a.m. we have been returning the fire, and from now on bombs will be met with bombs." The war for Lebensraum that Hitler always wanted had finally begun. Five years, eight months and six days of bloodshed and destruction lay ahead that would see some 40 million persons killed and much of the cultural heritage of Germany and Europe destroyed. The German people had surrendered their will to one man and he had plunged them into a new world war to fulfill his own mad ambitions. The History Place - Defeat of Hitler - Quest for a Nazi Empire, 1939-1945.